and in 2007 she chooses a bar in Egia as the subject for an ambitious project. Here in a working class area of San Sebastian, dispersed memories of her childhood are concentrated. Despite gathering a group of characters together, who to the viewer are anonymous, and presenting certain differences with respect to the allegorical echo which is observed in traditional family groups or in the diverse accounts of “the artist’s studio”, it’s also true that in this painting we perceive a bond of affection or at least the desire to connect this genre scene to her own biography. Assuming the intention to elaborate on the first sketch of the idea to which she wants to give form, this time the process is long and slow. 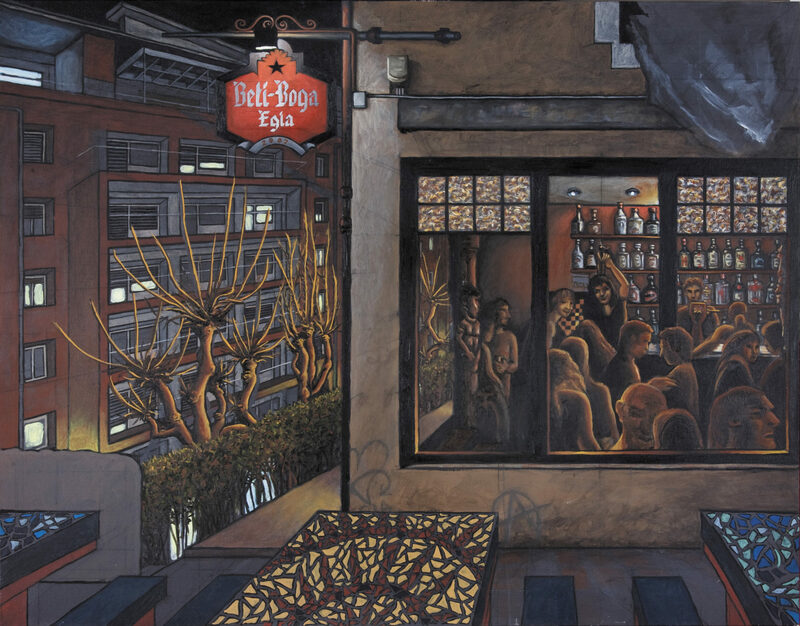 She thinks of the format that a work of these characteristics should have, she studies the spaces to be represented and in the end confines it to two: The outside world on the left and the inside of the bar on the right. Thus she avoids excessive simultaneity of fields of perspective, so dear to her usual practice. When she starts the pictorial combat, as she already has the structure clear in her mind, and she trusts the validity and perseverance of this initial blurred image that her instinct ensures, she takes a step back to achieve an effective construction in which the tension works and in which the union between the characters and the space are not diluted. She doesn’t forget the rough turbulence of things when they are in their natural habitat, leaving some elements to the free flow of the paint.